Looking back over the year, I have been thinking alternately that the weather is milder or cooler than it should be, but never that it was too wet. In late October I walked through fields which were unbelievably dry for this time of year. An early warm winter in January led to quite a cold spring, but summer has been pretty good. This has meant a lovely golden autumn, and a very fruitful year for wild plants, except those that got caught by late frosts. Rain came at the time we need it, in late spring and early summer when many plants grow most strongly, and the summer was sunny, something else plants need. Warmth went on well into October. I gather parts of England and Wales are expecting a bumper wine harvest, and local vines have grapes. Look out for the vintage of 2016! I mentioned last month that the barnacle goose had come back to Withybed to join the flock of Canada geese, as in most autumns. However, the geese have moved on because the new Withybed Marina is being dug in “their” field. So, if you’ve acquired a flock of Canada geese near you, look out for the barnacle goose, and let me know! The swans have come back – an adult pair and six beautiful grown-up cygnets. The gorgeous mandarin drake is around too. The turning of leaf colour seems to get later as the years go by. I guess this is part of global warming, as our autumns become, on average, warmer later. In late October I rediscovered the beauty of the Redditch Ring Road, as I do twice a year. Planting of mostly native trees was really well done when those roads were established. Now they are full grown they have spectacular blossom in spring and leaf colour in autumn. When you read this in December my guess is that some of the trees, especially the oak, will still be red-gold, while others like ash are bare. On many of the trees you can see the flowers of next year – catkins. Hazel and alder catkins will be quite long already, appearing as the leaves fall in the autumn. Leaf buds will be there on all the trees, and that’s one way you can identify them when the leaves have gone. Ash trees have blunt black buds like tips of charcoal. Beech has long pointed glossy brown buds. The oak has little clusters of round brown buds. The horse chestnut has big brown buds which later in the winter start to get sticky. It’s good to know that next year is in preparation already. Among these deciduous trees will be some evergreens. This name is rather misleading. Evergreen trees do shed their leaves, but not all at once or seasonally. They gradually lose their leaves throughout the year and grow new ones. Although there are a lot of evergreens round here, very few of them are natives. There are only four native evergreen trees: Scots pine, juniper, yew and holly. There is also an important evergreen creeper: ivy. Most of the pines round here are not Scots pines, and none of the fir species are native. Nor are the glorious Wellingtonias which stand out in Alvechurch. A lot of these trees were introduced to gardens and estates several centuries ago, and “big houses” round here often have groups of them. The Shrubbery in Alvechurch, the houses up Cooper’s Hill and parts of Barnt Green are good examples. In the 20th century, many conifers were planted in plantations for commercial purposes, such as those on Newbourne Hill in Rowney Green. Unfortunately these plantings have generally been at the expense of native trees. Two of the native evergreens, Scots pine and juniper, have reduced hugely in number over the centuries. In Scotland there are several places now rescuing and replanting Scots pine, which used to form the huge Caledonian forest. Juniper is a moorland shrub, and recently has suffered from disease as well as losing its habitat. Again, there are attempts to replant it. It’s well known as the main flavouring for gin, which some of us have been using recently for our sloe and damson gin. Neither of these grows naturally round here. Some pines are so well established that people think of them as native. One of these is the Monterey pine, which grows well near the sea on the south coast. We had some on the edge of the farm where I grew up, and they were often the source of our Christmas evergreen boughs. Mediterranean pines are common too. So though not native they are familiar, and you can collect pine cones for your Christmas decorations. They tend to be planted as one-off large trees, with big deciduous trees like oak, beech and chestnut, and look very attractive. Spruce (the traditional Christmas tree) and other firs are more likely to be in plantations, and it is these that have often driven out natural woodland. Being soft wood, they are quick-growing, and were very popular for planting when wood was much in demand. Now many are being felled (and hopefully used) and replaced by native deciduous species. The problem is that the network of flowers, insects and birds that live in our deciduous woods don’t like coniferous plantations. The third native evergreen, holly, is thankfully still plentiful. It grows in the open and as an “under-storey” beneath other trees. It was much prized in the past and often planted round settlements. The main reason was that it provided a food source for animals in the winter. This respect was added to by the mythologies attaching to the tree. In some places holly trees grow to a great height and have huge trunks: this takes centuries as they are slow-growing. The lower leaves of the tree are the familiar prickly kind, dark green and glossy. They are particularly prickly when young. Higher up the tree, though, they are often prickle-free. Grazing animals love to eat holly leaves, but generally cannot reach the higher ones and can’t eat the prickly ones, which is why the trees protect themselves this way. However, people used to coppice or pollard their “hollins” or groups of holly trees in the old days, and feed the foliage to cattle and sheep during the winter. I have seen this still being done on hill-farms occasionally. They are highly nutritious. Many of the woodlands round here were originally grazed by farm animals – as well as wild animals like deer. This meant that they wouldn’t grow scrub under the trees, or have many flowering plants. The best example is Piper’s Hill near Hanbury, also known as Dodderhill Commons as it was common land. 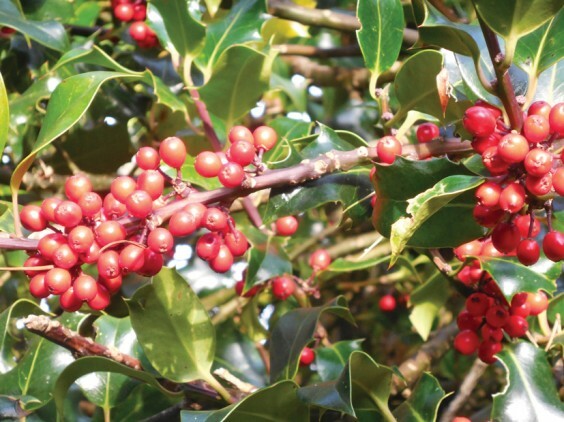 Because of the way holly grows, it often survived grazing and may be the only under-storey species, with the possible exception of brambles, poisonous plants, and grasses. Holly flowers in May, usually, though it occasionally has an extra winter flowering in a mild year. I found some flowering here in Withybed last January. In May it attracts the holly blue butterfly, as well as being good for bees and other insects. The familiar red berries are there in the autumn, very attractive to birds and in colder years often eaten well before Christmas! A good berry crop comes from a good spring and summer, and is not a sign of a hard winter to come. It is very good this year. Mythologies abound around holly, one of the 13 sacred trees of the Celtic calendar. Its evergreen leaves made it a tree of immortality. The trees had power over witches, and helped animals give birth. The holly was King of the Woods – there is a figure called the Holly King who is another version of the Green Man, the spirit of the woods and nature. Holly was always male, and complemented the femaleness of ivy. Ironically, of course, the red-berried holly trees are always female. It has always been thought unlucky to cut a holly tree down. However, you can take branches from it for your midwinter decorations. Because it was such a powerful tree, it has been incorporated into Christianity, becoming a symbol of Christ, as in the many “holly and ivy” carols. It was for many centuries called the “Christmas tree” until this name was taken over by spruce in Victorian times. The robin with its red breast is often associated with holly, and is also subject to a taboo on killing it. It is also traditionally male, even when female! More practically, holly trees were used as boundary and pathway markers, easy to find in the winter. They also make a great stock-proof hedge. The wood was used for all kinds of small objects. Holly was thought to have power over horses, so horse-whips were traditionally made of holly. The name occurs in many place-names in England. Our own nearby Hollywood is one of them. There are Holly Granges and Hollybush Lanes and Hollins all over the Midlands, and names like Holmes and Hollingworth may also come from holly. The fourth tree, the yew, is the churchyard tree. It has poisonous red berries, though birds can eat them. It is the tree of death, but also of eternal life. Yews grow to tremendous ages: the Alvechurch churchyard yew is 500 years old, the Cofton church one even older and the Tardebigge one not far behind. They were sacred trees before Christianity, and sometimes pre-date the churches they grow by. There are hundreds of churches in England that have yews planted by them. The branches were often used as “palm” for Palm Sunday celebrations, and for winter decoration. Yew is less noticeable growing in woods, though it is quite plentiful in woodland round here. The wood was used for arrows. As December goes on, we will notice the holly and yew again, dark and glossy against the bare branches of oak and ash. This combination of fire-red and dark-green is part of the traditional midwinter solstice, when the sun reaches its lowest and will then brighten for spring. Midwinter was full of fire-festivals, and I shall celebrate mine with a Yule log this month! My poem takes up the “gender-bending” nature of the mythology around holly, which is common in midwinter legends and celebrations. Not yet bird-stripped in a mild autumn. Cattle and sheep winter feed. Cattle and women give birth safely. The King of the Woods, they call him. May just as likely be a hen bird. Pantomime Principal Boy in the dark of winter.